If you're one of the unlucky SOBs to have the shoulders spawn at 52.5 / 72.9 like I was, you know it's a pain to get. Seemingly impossible, it IS possible IF you have slow-fall. If you don't have it you can get a cloak-glider or a potion that can give you slow-fall. You will need it. Next, if you can't actually find it, it looks like it's in a cave; it's not. Back up and look up, on top of the mountain peak. You should see it and instantly realize why it's a pain. There is no way to get to it directly. However, if you look over to the peak beside it, you will see a large, red skull with a fire under it. This is where Progenitus spawns. Follow that peak left and you will see a gradual decline. This is the path we take. The path starts a couple over at 50.5 / 74.8. Follow it up, across the narrow bridge, to the gap between the peak you're on and the one with the skull. 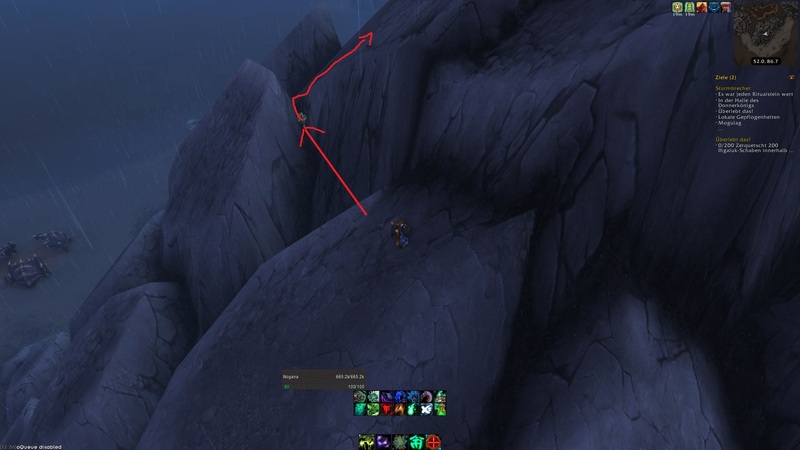 If you mount up and make a running jump from to top of the peak, you should be able to clear the small gap. From there, move around Progenitus. You should be able to move around him without aggroing him. From the far edge, you should be able to see the shoulders. Pop slow-fall, mount up again, and make a running jump at the far peak. Once over it, disengage slow-fall by right-clicking the icon or you may over-shoot the peak. 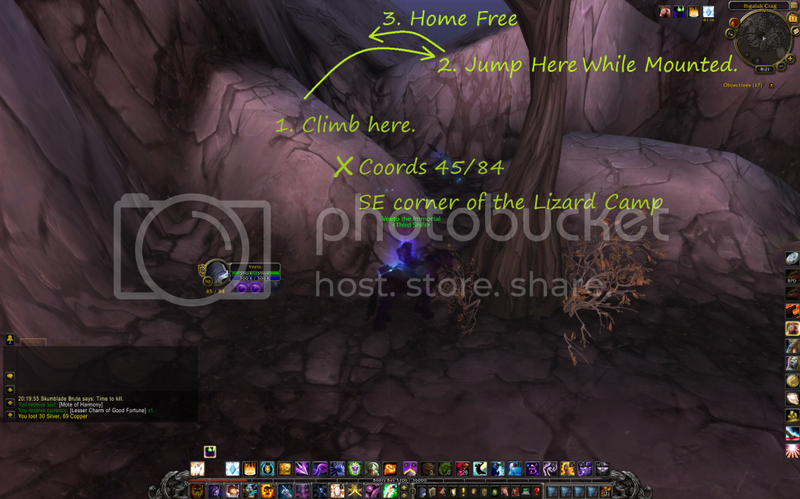 If you're not mounted for either jump, you will probably fall short. Regarding some posts about the "impossible" one on the peak at 53.35, 83.51. 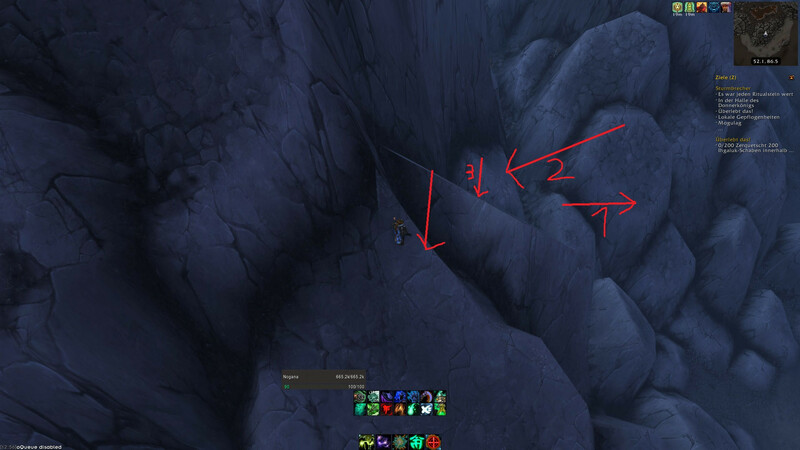 I, as a Rogue, have found a way to get to this one, as have others probably. This one has Skumblade Filfthmongers littering the southern face, which provides a beautiful little exploit for us Roguers. Find the one that is as high up as they get - if there aren't any particularly high, wait for them to respawn, it usually takes anywhere from 5-10 minutes. 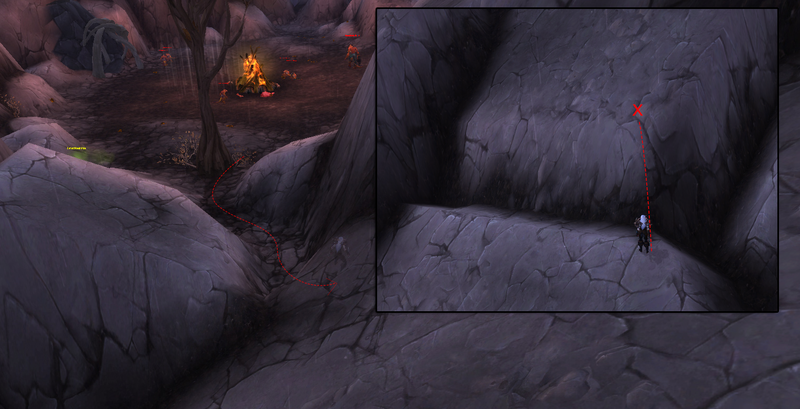 Once you locate the highest up once on the right side if you face north, Shadowstep to him and sap him. This will stop him from jumping down, as they do, so you can step to him if you fail. You may be able to jump to the rock to your right now, it is slightly lower than the platform you should be on, but to be safe I used a Goblin Glider to glide about 2 meters forward, do a 180, and land on the lower edge of that platform. From there, jump to the higher up ones, and sprint from the highest one you can go to the lower edge of the massive platform that the shoulders are on. Hope this helps people get this. Similar concepts could also apply for other classes, such as druids, maybe warriors, but I am pretty sure charge will just bug. Good luck. I spent a long time swearing at Blizzard for obviously bugging the Vargoth-quest thing that turns you into a saurok, allowing you to jump. I did it a long time ago, then went on a 4 month break and when I came back, the shapshift was gone. I filed tickets and what not, only to discover - today - that the Vargoth quest is re-given along with the other crag-dailies, starting with Ihgaluk Crag. got it today, at 44,83. go by the water, if you are not a lock or shammy, use the Reins of the Azure Water Strider, really tiny but exactly was standing on 44,83 when i could click on it. You can get to the shoulder without using the Skin of the Saurok buff. You can simply go up to the hill where Progenitus exists and use a slow fall ability, such as Levitate or Slow Fall. It is also possible to float over there with the slow fall ability granted by Noggenfogger Elixir. Simply remove the spell before you go over the cliff the Shoulder is on. Provided it is spawned on the cliff. Finally after a while, I gave in and used Aviana's Feather to get it. I don't know if anyone will read this.. But you don't need the daily to get the Skin of the Saurok buff! You can just do /bow in front of Kroshik ! That helps a lot. I used the Throbbing Blood Orb to get to it. "One false move and this stone will crumble to dust in your hands."